Please select your preferred Head Style from the list below. After clicking the head style, you will be able to select your desired length. If you have any questions need assistance, please contact us. We will be glad to help. 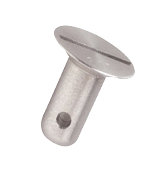 Sizing Chart: All studs on this page have a head diameter of 5/16" (.312) and a shank diameter of 11/64" (.171). For your reference, we have included a chart at the bottom of this page which shows the panel thickness ranges and corresponding stud lengths. This drawing is for reference only. The chart below has the stud dash number in the far left column. 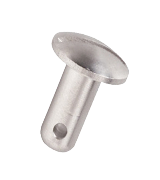 This is the number that is stamped in the head of the stud. 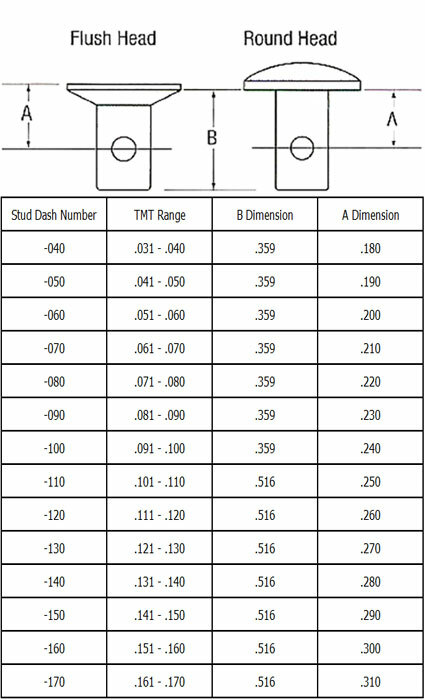 The next column shows the Total Material Thickness range (TMT) of each stud length. 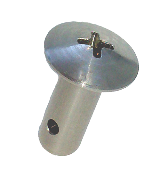 The next column shows the B dimension of the stud (blank length). The far right column shows the A dimension for each dash number so you can measure and replace an existing stud. 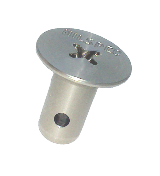 * Please note: A-Spec studs only vary by .010" from size to size so it is important to measure very accurately when using them. Dimensions are in inches. For metric conversion, use this formula: Inches x 25.4 = mm. mm ÷ 25.4 = Inches. If you have any questions or need anything else, please Contact Us.